Family is at the very heart of the Amish way of life, and nothing says family like sharing time in a rocking chair! This perfectly kid-sized chair, built and finished by hand by dedicated craftsmen right here in the USA, makes a strong, sturdy, and beautiful addition to the family home. Whether in the playroom, the living room, or the reading nook, the Bow-Back Windsor Kids' Rocking Chair offers its lucky owners a place to build treasured memories sure to keep them company throughout the years. The quality of the kids' furniture crafted by our Amish woodworkers is second to none. 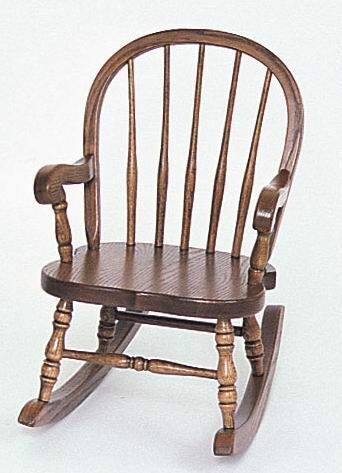 All elements of this rocking chair are built from solid wood, with strong interlocking joints giving the chair the sturdiness and quality it needs to serve your family for generation after generation. Rest assured that every piece is lovingly and carefully built from the finest American materials - no veneers, no shortcuts, no questions. This beautiful piece is available in your choice of cherry or oak wood stained with one of our rainbow of stain shades. Your rocking chair will be made to order, so if you'd like to view a selection of stain samples while the woodshop is putting your chair together, please don't hesitate to give us a call or an email - we would love to help you make sure that your vision is brought to life down to the last detail!